In the parable that Jesus told, the foolish young women came after the door had been shut. They had come too late. S JESUS LEFT the temple for the last time, his disciples spoke to him about the beauty of the Lord's house. Like all other Jews, they took much pride in the temple where God was worshiped. And they were surprized to hear Jesus say, "The time is coming when the stones of these buildings shall be torn apart." On the Mount of Olives, Jesus rested for a while before going on to Bethany. And his disciples gathered around him there to ask when the time should come that the beautiful temple would be destroyed. No one else was near to disturb them, and Jesus talked long and earnestly to his disciples about the things that would happen to Jerusalem, and later to the whole world. He told them that men would come who would claim to be the Christ of God, and what many would believe in them. He said that great wars would be fought among the nations of the earth, and that troubles of different kinds would come upon the people. Then he said that before the end of time the gospel of the kingdom would be preached, not only among the Jews, but to all people in every part of the world. How strange these things must have sounded to the disciples! for they had always believed that salvation belonged to the Jews only. Then Jesus told the disciples the parable of the ten young women, called virgins. Five of these young women were wise and five were foolish. All had been invited to the marriage of a friend, and they started to meet the wedding-party. They took their lamps with them to give light, for the wedding would take place at night and only those carrying lights would be allowed to join the wedding-party. But the wedding-party was slow in coming, and the young women grew tired waiting. So they fell asleep. At midnight a cry was made that the wedding-party was coming, and the young women aroused and began at once to trim their lamps to be ready to join the procession when it came by. Now the five who were wise poured more oil into their lamps; for they saw the light was growing dim, and they had brought an extra supply of oil with them. But the five who were foolish had brought no more oil, and they, too, saw that their lights were growing dim. "What shall we do?" they asked each other. Then they spoke to their wise friends and said, "Please give some of your oil to us, for our lights are going out!" The wise young women did not have enough to give to their friends in distress, so they answered, "You must go to them who sell and buy for yourselves. We do not have enough to share." And while they hurried away to buy more oil, the wedding-party came, and the five wise young women joined the party and went to the home where the marriage festivities would take place. When all the guests had entered, the door was shut, and no other persons could enter. 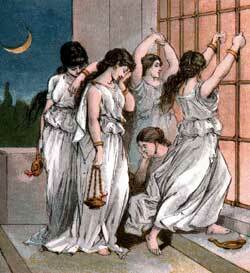 The foolish young women came after the door had been shut, and they knocked; but the bridegroom would not let them in. They had come too late. By this story Jesus wished to teach his disciples to watch and be ready, for they should not know the time when he would call for them to leave this world and go to be with him. If they should not be ready when he should call, they would have no time left in which to make ready, but, like the foolish young women, they would be shut out of heaven. Jesus told the disciples what will happen at the end of the world. He said that then the Son of man will come in his glory, bringing all the angels with him. And he will sit upon the throne of his glory. And before him all nations of the earth shall be gathered, and he will divide the good from the evil. Those who have believed in him he will place on his right, and those who have disobeyed he will place on his left, just as a shepherd in that country divided his sheep from his goats. The disciples no doubt had watched the shepherds come in from the fields and separate the sheep from the goats in their great flocks, and they understood how this separation will be. "Then the King will turn to those on his left, and will say to them, 'Depart from me, you who are cursed, and go away into everlasting fire, which has been made ready for the devil and his evil spirits. "And those on the right," said Jesus, "will go into life eternal in heaven, while those on the left shall be turned away into everlasting torment."